Llámanos al 1-877-619-5803. ¡Te atendemos en español! Standard equipment FREE for up to 4 TVs DISH non-DVR receivers use the DISH Home Interactive User Interface and offer features that enhance your TV viewing experience. DISH non-DVR receivers sport a modern look and can support two TVs with its two tuners. If your life is hectic, a DVR receiver from DISH can make it a little easier by letting you record your favorite shows and watch them when it?s convenient for you. 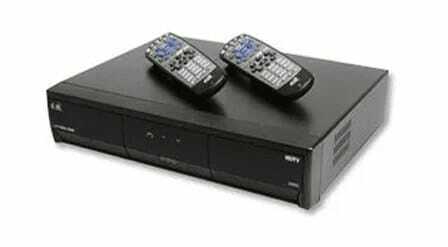 A DISH DVR receiver also lets you skip commercials, reducing the time it takes to watch a show or sporting event. Learn more about the features of DISH DVRs. DISH offers the best HD receivers on the market. If you are looking for a TV package with HD channels and a high recording capacity, look no further than DishLATINO®. With HD receivers like the Hopper®, you can record up to 2,000 hours of your favorite shows and record up to 16 live TV shows in HD. Recording capacity varies; 2000 hours based on SD programming. Record ABC, CBS, FOX, and NBC plus four additional channels. Customer activation required. Super Joey required. Additional monthly fees apply: Hopper, $10; Joey, $5; Super Joey, $10.